Here at Code Club we think our volunteers are the coolest people on the planet, and we want to do everything we can to support them and encourage new people to join the gang. 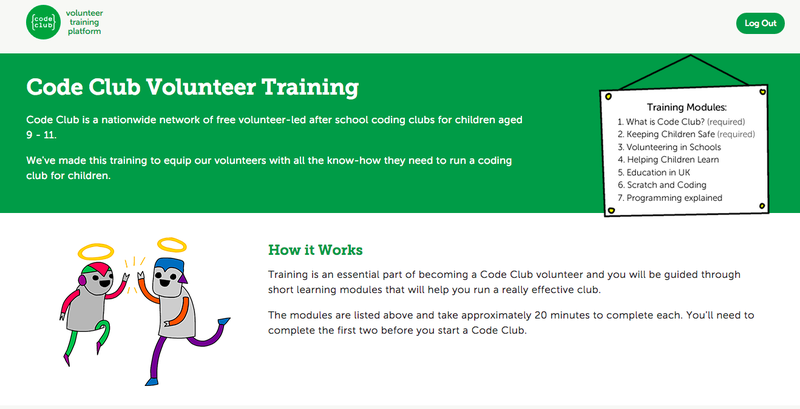 Over the past few months we’ve been developing some shiny online training to give our volunteers all the information and inspiration they need to start their Code Club journey. There’s something for everyone — whether you’re new to volunteering in schools or have never used Scratch before, we’ve got you covered! New volunteers will need to complete two required sections covering the practicalities of setting up a club and volunteers’ responsibilities when it comes to keeping children safe. These should take less than 45 minutes, so you can get ready to go in a lunch break, commute or free period. We’ve been preparing this training since last summer, and we couldn’t have done it alone! The marvellous team over at Chocolate Films have been making video content and some very cute animations of our robots and we’re really grateful that Perrymount Primary School and Moortown Primary School allowed us to visit their clubs with cameras and big furry microphones to catch them in action. We also persuaded several of our volunteers to sit in front of cameras under hot lights telling us about their adventures helping children learn to code – so a big thank you to David Balkwill, Alex Blewitt, Paula Clerkin, Phil Golden, Andy Lulham, Geri Reid and Matthew Valentine-House too. We will also be running some real life training sessions across the country too, so look out for those coming to an area near you in 2015! Memory — memorise and repeat a sequence of random colours! Dodgeball — a platform game, in which you have to dodge the moving balls and reach the end of the level. Brain Game — a times table quiz, in which you have to get as many answers correct as you can in 30 seconds. Catch the Dots — a clone of a great game called ‘Gyro’. Match the dots to the correct part of the controller. Clone Wars — use lightning bolts to save the Earth from space-monsters. Create Your Own World — learn how to create your own open-world adventure game!